Mixing dehydrated ingredients can make an interesting and nutritious meal. You SHOULD try this at home before heading out. 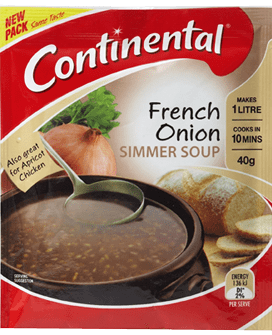 Here is an example: McKenzie’s Superblend Fibre ‘Freekah, Lentils & Beans’ (350 grams) plus Continental French Onion Soup (49 grams) plus Continental Classic Tomato CupaSoup (24 grams) . I also added a pinch of Masterfoods (dehdrated) Ground Chillies (Hot) and about a teaspoonful of Masterfoods Middle Eastern Spice Blend (Harissa). These three ingredients weigh 423 grams and deliver 58673 kj (1468 calories = 3.5 claories per gram!) in a 1 litre billy (@ 15 minutes simmering) probably enough for FOUR people! I found it a little salty for my taste (at home – I might feel differently after a hard day on the trail). This could be adjusted by adding the tomato soup (where most of the salt is) to taste at the end.